Reno's top cool things to do reflect the many features, events, and activities making Reno a recreational, cultural, and historic place to explore. Reno's downtown redevelopment has transformed the face of the city in dramatic ways - the train trench, Riverwalk, condo conversions of old casinos, and the Reno Aces Ballpark to name a few. Our main tourism promotion organization, the Reno-Sparks Convention and Visitors Authority (RSCVA) is in the thick of it as well, using the tagline "America's Adventure Place" to tout the many cool things about the Reno / Tahoe region. Renoites live life on the edge. To the west, the Sierra Nevada rise abruptly into a mountain zone of pine forests, alpine meadows, lakes, and splashing streams. To the east, the Great Basin opens up to wide open and empty spaces, dry landscapes, brown mountain ranges, and sagebrush plains. With one foot in each zone, we have a basecamp ideally situated for an uncommonly wide range of adventures. In a single day you can ski in the morning, kayak in downtown Reno in the afternoon, take a quick mountain bike ride on Peavine Peak, and top it off with drinks, dinner, and a show that night. If that isn't enough, Lake Tahoe is less than an hour away, with its own unique combination of indoor and outdoor activities. There is hardly a week throughout the year when something cool isn't going on in the Reno / Tahoe region. Some of the biggies include Hot August Nights, the Reno Rodeo, Reno River Festival, Tour de Nez, Street Vibrations, Earth Day, Artown, Great Reno Balloon Race, National Championship Air Races, Best in the West Nugget Rib Cook-Off, and more. Few cities our size have such an amazing variety of annual big events. Seeing Reno as a center for art and culture used to be a real stretch, but that was before things like the Artown festival blossomed and the unique Nevada Museum of Art opened in 2003. A number of other art galleries, exhibits, and artist studios have arrived in Reno over the last few years, with a concentration of such enterprises located in what's called the Truckee River Arts District. We've also got the excellent Pioneer Center for the Performing Arts and a selection of top quality artistic endeavors available at the University of Nevada, Reno. Not every town has a river running through it, but Reno does. The Truckee River brings us lots of cool things, not the least of which is some of ​America's best drinking water. The river also brings unique recreation opportunities, like a whitewater park right in downtown Reno and another in Sparks that opened in June 2009 at Rock Park. The Reno River Festival brings kayaking competition and a great party to the river area each year. 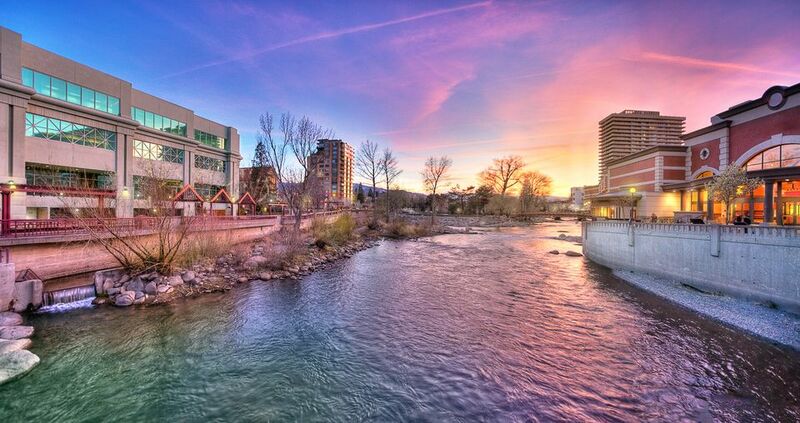 There is a walking a bike path that follows the river through the Truckee Meadows, passing through shady Idlewild Park and providing pedestrian access to downtown Reno's ​​Riverwalk District. For some, the good news is that you can party, gamble, drink, shop, and most everything else 24/7. For others, not so much. Reno / Tahoe casinos never close, and neither do a variety of other businesses. If this is your thing, it's there to enjoy. If not, it's easy to avoid. The truth is, most of us carry on normal lives like people everywhere else, patronizing the casinos or not as we choose. After you live here for a while, you realize the gaming industry is just another cog in the Nevada business wheel. Upon seeing Lake Tahoe for the first time, Mark Twain wrote, "I thought it must surely be the fairest picture the whole earth affords." (from Roughing It, 1872). Twain's visual holds true today - Lake Tahoe is still deep blue and ringed by the forested slopes of snowy Sierra Peaks. I could go on and on with the superlatives, but nothing I say will substitute for your own lake experience. The best way to get the picture is by taking the 72-mile drive around Lake Tahoe to see for yourself. Way back when the West was being won, emigrants streamed through the Truckee Meadows on their way to populate California and try to get rich during the Gold Rush. There wasn't much reason to stop here, but the place slowly grew as a crossroads for commerce and a place to get across the Truckee River (our original name was Lake's Crossing, after Reno founder Myron Lake). When the transcontinental railroad arrived and the Comstock Lode was discovered at Virginia City, things started booming. From the Nevada Historical Society in Reno to the Nevada State Museum in Carson City, there are lots of places to explore our history and historic sites. You don't have to be a baseball fan to appreciate what a cool thing it is to have a professional baseball team and new baseball stadium right in downtown Reno. The Reno Aces, affiliated with the Major League Arizona Diamondbacks, put on a great show at every home game, with fun promotions and fireworks after Friday games. It's cheap entertainment too, with tickets starting at less than admission to the local movie theater. The Black Rock Desert is part of a much larger area of public land called the Black Rock Desert Emigrant Trails High Rock Canyon National Conservation Area. This place is an incredible gem and well worth exploring for its wildness, human history, and geologic wonder. The Black Rock playa is one of the flattest places on earth and the place where the current land speed record was set. The playa is also the site of the annual ​Burning Man festival. The Friends of Black Rock High Rock are the go-to people for information about this BLM administered piece of Nevada. What Are the Neighborhoods in Reno Like?